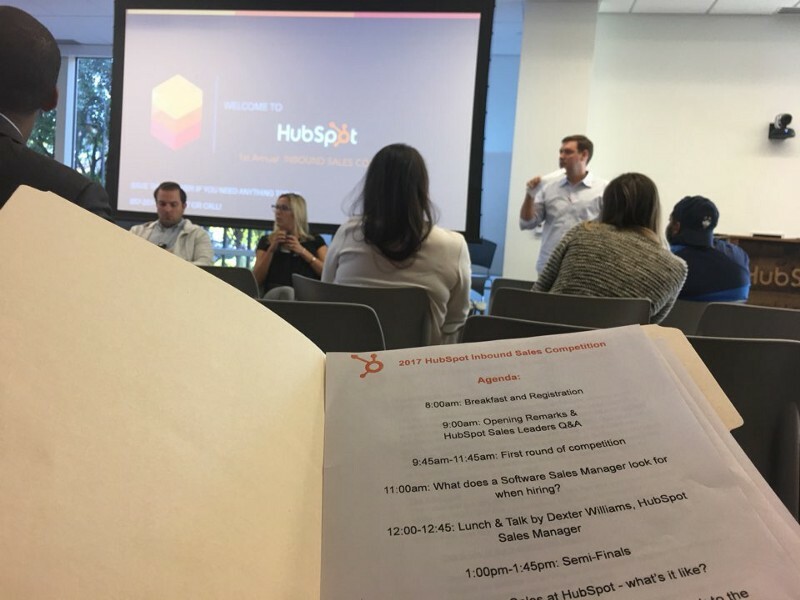 Hubspot, a global inbound marketing and sales platform company (proudly made in Boston), hosted its 1st Annual Inbound Sales Bootcamp. I decided to participate since I wanted to learn not only more about IT sales, but also how this event would be run from an education perspective. 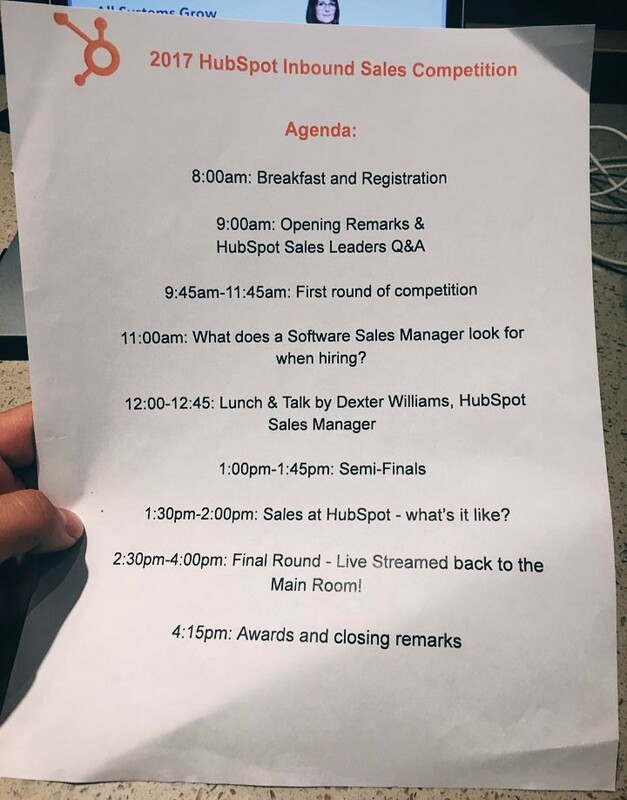 I’ve been to many hackathon/competition events but I’ve never been to a sales competition. I’d like to share how the event was run and what I learned from this great event. image from www.hubspot.com. Their office is indeed impressive with 2 beer gardens. Two. 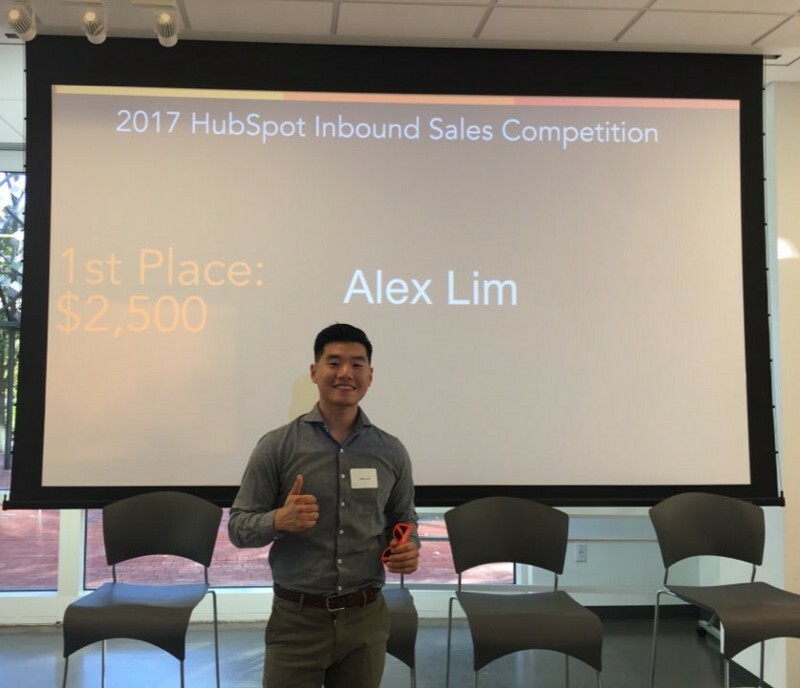 HubSpot’s 1st annual Inbound Sales competition embodied a few elements of Babson’s entrepreneurship education — competitive, experiential-learning, and a whole lot of human interaction. HubSpot has a very clear structure of recruiting, initial training, promotion cadence across different functions such as business development and sales. I found this initiative very clever and effective in that they had their prospective candidates go through mock sales processes rather than a traditional way of interviewing. They probably saw 5x of what they could have discerned through resumes and interviews. Since the cases for competition evolved around selling HubSpot softwares, participants had to have the least exposure/familiarity with HupSpot products. 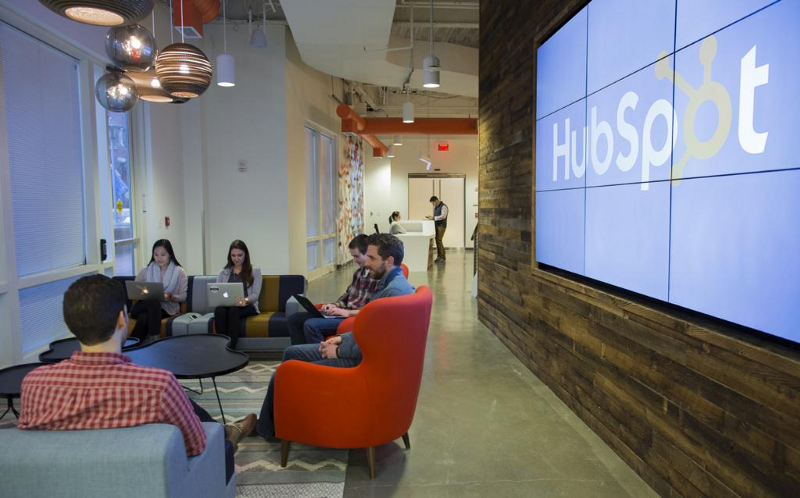 Not only are these participants the potential employees, but chances are that they will be potential clients, given how widespread HubSpot is among small and medium businesses. This reminded me of a ’17 SXSW edu session I attended about how Salesforce had launched Trailhead, an online education platform for college students to learn about the Salesforce CRM system. The logic behind such initiative by Salesforce was that the more equipped the students are with Salesforce, the bigger user base it will garner in a long term. This event didn’t dive into the product details and how inbound marketing works, but it was convincing enough for us to realize its importance. The competition forced you to be nervous, just like a real sales process. The competition consisted of 3 rounds of face-to-face role-plays in which you played a role of a HubSpot Business Development Representative with HubSpot sales people as a buyer and a judge. Each round entailed a different set of objectives and one would have to score high from the judge in order to proceed to next round. The fact that the prizes were no small (1st: $2,500, 2nd:$1,500 and 3rd: $500) gave everyone a great deal of motivation to do our best. I think that the organizer did a great job of putting together such relevant sales cases for each round. They were greatly aligned with what HubSpot undergoes in real sales process, as each round covered a soup-to-nuts process of sales from lead identification to qualification to closing. While we were so eager to find out about the result each round, we were never bored in waiting since all of the panelists and talks were coming from the practitioners and professionals in the sales fields. It’s so easy to speak more than listening. The second round, after lead generation, was to convince a buyer that your product solves a seller’s pain points. After I was done with my second round and received feedback, I realized how poor I was in listening. I was so obsessed with proving my ability to demonstrate how great the products were: its robust product features, simplicity, and price competitiveness. However, product pitch does not uncover customer pain points; in fact, it hinders your customers from speaking candidly about the true challenges, since you’re talking so much. Most of the time, the seller and the buyer are on the same page in terms of the ideal. Most sales pitches are similar in that the seller is trying to address how her/his product will be a solution to that challenge. Meg, my judge from the second round told me about how my pitch would have been better if I kept digging deeper into her(the role she was playing) true challenges by asking about her experiences, feelings, and fear (in this case, moving from traditional marketing to digital marketing). This would have garnered me the perfect segue to me to talk about the product feature. Nothing I learned from Meg was new. It was just that I was so desperate about demonstrating my ability to “sell” in a short period of time in this competition. The truth is, I’d be more desperate when it comes to real life sales situation, so I’m better off in being strategic about asking the right questions and letting the buyer clarify the problems first. It’s easier said than done — just like how I fail to listen in real life. I just have to constantly remind myself of that. Being able to sell something is an experience with which we all should be well-equipped. A HubSpot sales manager has said that a big part of being a successful salesperson is to be comfortable with uncomfortableness. However, such skill does not only apply to sales processes, but in many situations in life. In fact, you can hardly find any part of life that does not involve sales or negotiations. Although this was just one-day event, I learned so much about what works and what doesn’t work in selling your message, let alone how it can be applied in different life situations. From an education perspective, I believe that formal education should incorporate teaching youth about such transferable skills via learning-by-doing pedagogy. Great job, HubSpot! Being a salesperson is like running your own business inside someone else’s company. I had learned this from my 3-months sales internship at Google, but I can’t think of any other job functions that give so much freedom in how you carry out your job. You can control your work hours, work environment, and more impressively, you get to travel around while doing your job. Nonetheless, such freedom, of course, comes with a great deal of responsibility and risk in attaining the desired compensation. I don’t think one would start a business without feeling confident about the product or service one is selling. I believe it would be the same case with those who would pursue sales career. 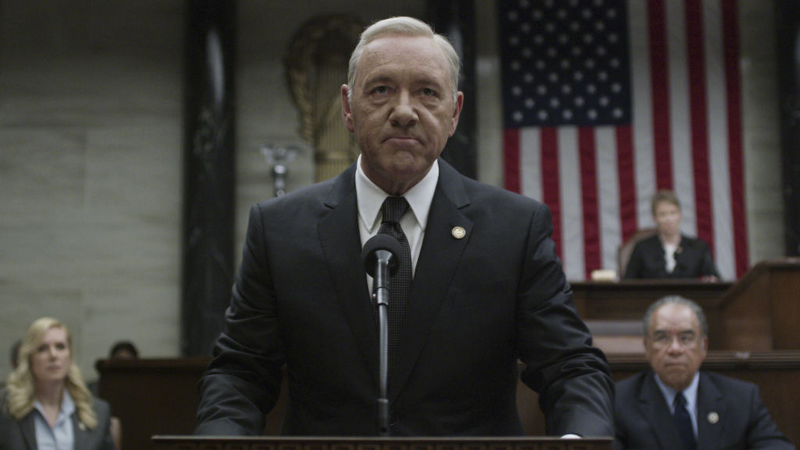 And if you do well… well, the payoff is quite attractive. How you find out whether you will love doing sales? = when do you fist bump with yourself? This question is probably the same as asking how you find out if you love doing anything in life. The whole “Do What You Love” ethos is really hitting the millennials hard in that it almost forces them to discover that magical moment that you somehow get the crystal clear picture of what you love doing. However, borrowing the words from a co-founder of Netflix, a Hubspot sales manager has told us that finding what you love is rather a collection of moments when you’re feeling so damn good about what you just did. If you feel that way before, during, and after you do sales, then you’re probably a good fit for doing sales for living. I want to extend my gratitude to HubSpot, especially Tom Murdock and Jordan Ames for organizing this fruitful learning experience, but also Donna Sosnowski from Babson CCD for introducing me to this opportunity.